Sean Dyche has praised Andre Gray's focus after bouncing back from the ignominy of a suspension for historic tweets earlier this season. Gray has been linked with an England call up, as well as a move to Tottenham Hotspur, having hit seven goals this term, six in his first taste of Premier League football. Dyche is delighted with his progress, which was stunted by a ban in September following a misconduct charge for homophobic tweets in 2012. Ahead of the trip to Swansea City, Dyche said: "I think, although he’s still quite green in the bigger picture of football, because he didn’t have what you would call a normal academy/first team background, he had to go a long way backwards before he went forwards – he’s got quite a solid way about him, and quite a focussed way. "He’s faced challenges to acquire his professional manner. If you’re Steven Gerrard, you’ve gone through the system as the top kid and come out the other end as a top player. "He’s not like that. So there’s an animal instinct in there to continue his journey constantly, and there’s challenges along the way to make it all make sense. "And some of those challenges are out of his world really, like the thing that happened early season. "It’s completely out of his thinking. He made it clear he’d changed, and he still got burnt. So it was a big thing for him to deal with." The sky is the limit for the former Brentford man: "He doesn’t seem to set any limits (on what he can achieve). "Without getting too deep about it, we attempt to do that for everyone here. That’s why I talk about guiding players. They have got to take ownership. It’s not me going on and saying you’ve got to do this, you’ve got to do that. The world is changing. It’s trying to give them knowledge of the tools to try to go as far as they can. I’m trying to open up these channels of thought to encourage them to go further and further. "I’m from the school where people used to scream at you a lot. And I’m sitting there thinking what are you screaming at me for? "So I thought when my time comes in coaching you work with what you’ve got. Don’t scream at them – try to educate them. Very rarely do I scream at players, even now. "You’ve got Joey who wants to converse and Andre is more someone who keeps it short, says give me some guidelines and I’ll attempt to work from them." 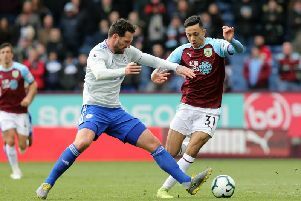 Dyche believes he can add to that raw pace and power as he develops at the top level: "I still think he’s got things he can learn, he’s still improving, I still think he’s getting used to the realities of the Premier League, because it’s not easy. But he is a player who is improving. That’s a thing I’m big on here. Whether he’s ready for England, that’s for other people to decide. "The basics are all there – can he score goals? Yes, of course. You know the higher you go in your career, you’re going to need more tools. You can’t just rely on the one good thing you’ve already got. So it’s about adapting to the all-round game, especially at international level."